Have you had the flu/cold yet? It is merrily winding it’s way thru our family … starting with HotRod last week, dh this weekend, HamBone (who turns 13 today) and Kit on Monday and now I’m starting to brew it. Seems it takes about seven days to run its despicable course thru our bodies … so we may be down for a bit. But does this stop me from reading and/or knitting … NOT! I just finished a super-secret submission (the pink bundle at the top of the screen) and I’m getting ready to start another submission with the Tofutsies you see in the lower left. Have you used Tofutsies? It’s a blend of wool, soysilk, cotton, and Chitin (made from shrimp and crab shells that’s naturally antibacterial … how cool is that?). My submission isn’t for sox … but you’ll have to wait to see what I’ve got dreamed p for that luscious yarn! On the reading table: I just finished Sisters of the Quilt, a trilogy by Cindy Woodsmall. You can read my full review here, but the bottom-line is that this isn’t one of her best told stories … AND you have to read all three to get closure on the plot and subplots (I HATE that!) … and … well, ’nuff said about that book. On the other hand, I’ve just finished The Pope and the CEO … a book I’ve mentioned before by a former Swiss Army Guard who learned life lessons from Bl Pope John Paul the Great while serving in the Vatican. It was every bit as good as it sounded and well worth a read … here’s the full review I just posted. A book we’re enjoying in the homeschool-classroom is A Philadelphia Catholic in King James’ Court (and it’s companion study guide). This is a great apologetics books — a Catholic boy moves to rural Kentucky where is uncle is a fundamentalist Christian, a good man who tries to convert the boy away from the Catholic Church. As the story unfolds, the boy (and his family) end up converting the uncle! A well-written story that I’ve used with my now-adult children; the three younger ones are enjoying discussion how they would refute and convert. Excellent! 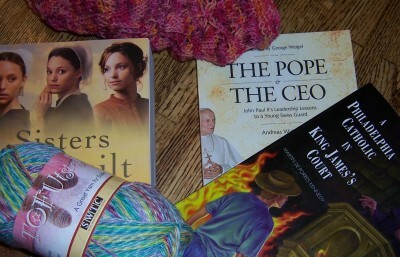 So, what’s on your needles and on your book table? Want to come play with us over at Ginny’s?